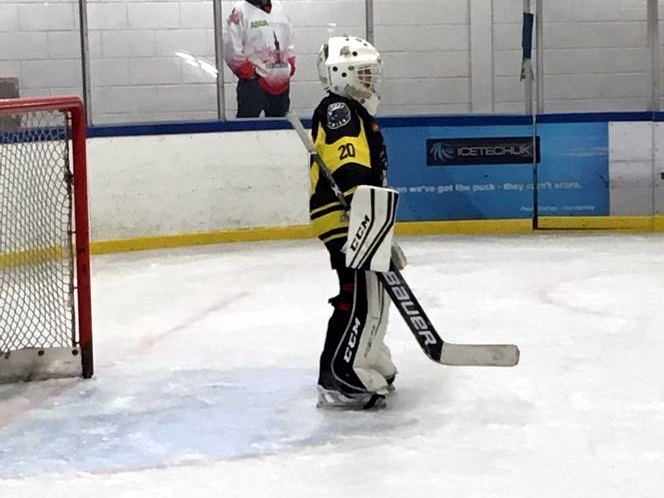 Widnes Wild Under 13’s made a trip across the country to face Grimsby Ice hockey Club, for the second time this season, on Sunday 31 March. After falling 15:3 on their last trip to Grimsby, the Wild came with a point to prove and a much improved team to help prove it. The Wild team had managed to post 2 wins against Grimsby when facing them on their home ice, however, with Grimsby’s rink having a very small ice pad, the Wild team knew this game would be a test of its own. The first pressure on goal came from the Wild, with just 40 seconds played Jared Knowles (10) came close to opening the scoring, narrowly missing the early opportunity. The play was up and down the ice, with both teams showing offensive skill, until Grimsby hit the net and opened the scoring at 2:30. It took the Wild until 9:24 before they struck back, when Adam Vigh-Yecsey (19) scored the first of his 6 goal haul. Cody Ogden added to the Wild’s lead at 11:04, scoring a short-handed goal whilst Austin Busby (8) sat a bench minor penalty for too many men on the ice. This lead was short lived as Grimsby equalised at 12:56 on a delayed tripping penalty against Harry Gilbert (40). The second period was full of action with Cody scoring what turned out to be his second goal of 4, just 41 seconds in. The next player to add their name to the scorecard was Aidan Lamb (11), scoring his first of 2 at 21:38. The period ended with the Wild leading by 6 goals to 3, with Cody Ogden (15) and Grimsbys number 3 sitting minor penalties during the period. Following an ice cut during the second period break, Grimsby came out strong scoring 2 unanswered goals in the first 30 seconds of play. With incidental penalties being called on Jared Knowles (10) (Body Checking), and Grimsbys number 2 (Roughing) at 32:18 the Wild were able to find their feet and show their ability to play 4 on 4 hockey, responding at 33:35 and, back to 5 on 5, again at 35:38 . The third period continued to be an exciting period with Grimsby refusing to hand over the match, scoring a further 3 goals. The Wild, however, continued to show their ability on the small ice, scoring a further 4 goals before the final buzzer. The game wasn’t just a story of 2 strong offences though, Wild netminders Roberts Ziraks (20) and Harry Bird (41) faced 41 shots in the 45 minutes of play. Comparing this to the 78 shots on the Grimsby goal, shows how well the Wild defence played. This season is the first that the Widnes Wild Academy have entered the competitive EIHA leagues and have teams at Under 9 and Under 13 and Under 15 level. 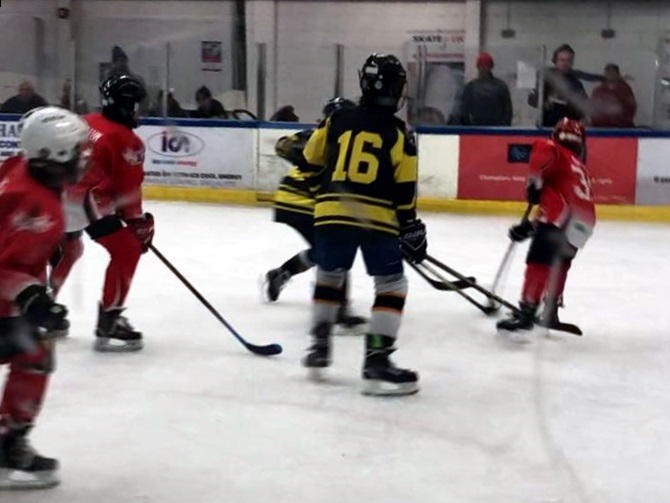 Planet Ice Widnes has a very well-organised and structured “learn to play ice hockey” scheme in place and are always keen to attract new players of all age groups – boys and girls. Anybody interested in joining the Wild Academy should contact the rink on 0151 420 7930 and speak to the Junior Development Officer and Academy Manager Mikey Gilbert. << First Away Win For Wild Academy Under 15s!